Warm days mean more outside time for pet parents and their dogs. 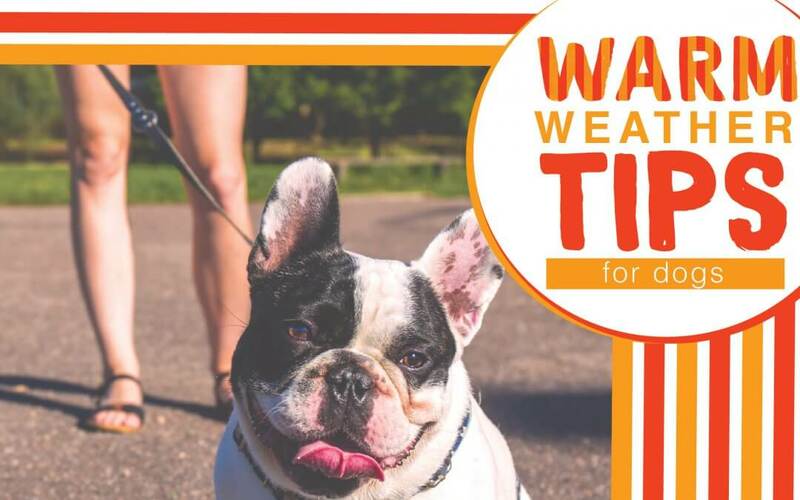 To keep a dog happy, healthy and safe during walks and playtime, take inventory of your pet products and be prepared for hot weather activities. __ Collars, Leashes, Harnesses: Now is the time to check these for wear and tear and to replace them if there is any concern that they could break. If your dog has grown, upsize collars and harnesses. __ Cleaning Supplies: How is your supply of poop bags? Do you need a new pooper scooper? It’s a good time to stock up on shampoos, conditioners, wipes and freshening sprays. __Flea, Tick & Mosquito Protection: Don’t forget that monthly flea, tick and mosquito treatment, and be sure to check your dog’s coat for pesky bugs and bites after any outdoor activity. __ Paw accessories: For extreme heat, paw booties and paw wax can help keep your pooch from burning its paw pads on hot asphalt, sand or concrete. __ Sunscreen: While dogs’ coats protect them from the sun, their skin can burn. For dogs with short hair or short haircuts, sunscreen is necessary before going outside. __Portable water bowl: If you are hiking with your dog or walking when it’s hot outside, keep a portable water bowl and water in your knapsack. __Treats: A long walk or hike may require a break to re-energize. In addition to your granola bar, bring along some dog treats in a treat holder. __Toys: It’s time for new balls, rope tugs and fetch toys to rev up playtime. __ Kiddie pool: During weather that is oppressively hot and humid, an outside kiddie pool may help your dog cool down. Do not keep a dog unattended near a full-size swimming pool. __Shaded area: When a dog is outside, a shade tree, patio roof or pop-up shelter can help guard against intense sun rays. __Fencing: Inspect your fence to make sure there are no holes where your dog can make an escape. If you have an electronic fence, check that it is fully operational. __Identification: In case your dog runs off or gets loose, it is imperative to have your pet chipped or tagged with updated information. __Lawn chemicals: Lawn and garden insecticides and rodenticides are harmful to animals, including dogs. Do not let your dog play on the grass and in your flower beds that were recently treated with chemicals. Dogs cannot perspire and pant to cool down. Severe heat can cause heat stroke or brain damage. Dogs with thick coats or pushed-in noses are at a greater risk of overheating, as are obese and older dogs. Take immediate action if you see any combination of these symptoms in a dog. Take the dog to a cool environment if possible and apply cold water to its foot pads, ears and abdomen. Experts warn against submersing an overheated dog in water, pouring ice over it or covering it in wet towels or blankets. Once the dog stabilizes, immediately take it to a vet. In several states, it is illegal to leave a dog in a vehicle during hot weather. Even a car with the windows open or the back of a truck on a hot day can be dangerous for a dog. The temperature inside your vehicle can rise almost 20º F in just 10 minutes. In 20 minutes, it can rise about 30º F — and the longer you wait, the higher it goes. At 60 minutes, the temperature in your vehicle can be more than 40 degrees higher than the outside temperature. Even on a 70-degree day, that’s 110 degrees inside your vehicle! During hot and humid days, it is best to limit walks and playtime to the cooler morning and evening hours. If possible, keep dogs indoors in a cool environment during excessive heat.